Shea butter and local beeswax with Coconut and olive oils infused with homegrown comfrey, plantain, yarrow, jewelweed and copperleaf. 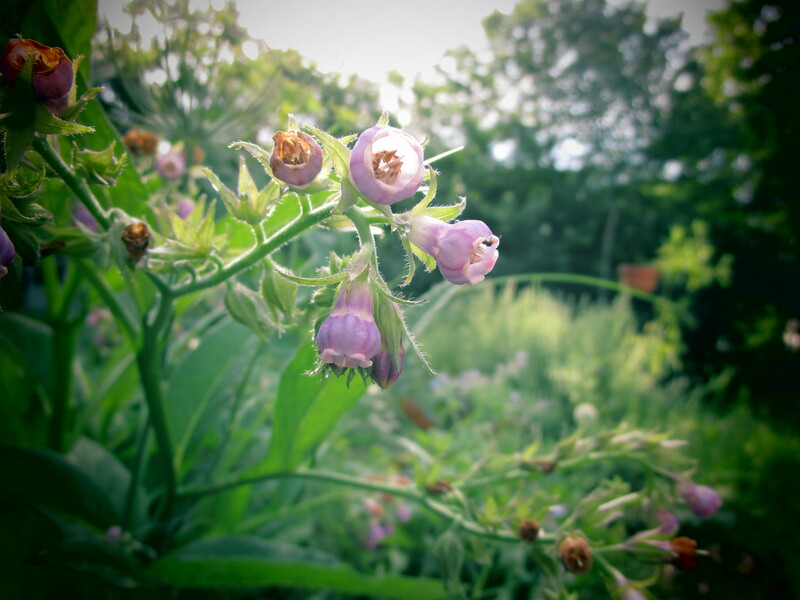 Comfrey is also known as boneknit and is known widely for it’s healing properties when applied to everything from minor wounds to broken bones. It literally helps to knit the skin together, speeding healing time and reducing scarring. Yarrow is most known for it’s ability to staunch bleeding. It was also known as Soldiers Woundwort because of it’s ability to staunch bleeding but also it’s antiseptic properties which reduce the chance of infection. It is also reported to lessen pain. Plantain is an anti-inflammatory, which makes it great for bug bites, burns, sunburn, poison ivy, sore muscles, sprains, blisters and cuts. This is another superb folk medicine plant that is making a comback in popular culture, mostly because it grows so abundantly. Copperleaf also grows abundantly but is vastly underrated. This medicinal herb is used to draw out infection and speed healing. Used for wounds and cuts that have lingered too long, Copperleaf stimulates the immune system to fight against infection too. Jewelweed a diminutive orange flower which is the perfect antidote to poison ivy and is all around beneficial to skin. All these powerful herbs are grown right on our 1/3 acre urban farm and are infused into a base of organic coconut oil or organic olive oil. They are then blended with organic shea butter and just a bit of local beeswax. Gentle, with no added fragrance, this salve is good for children and adults alike.